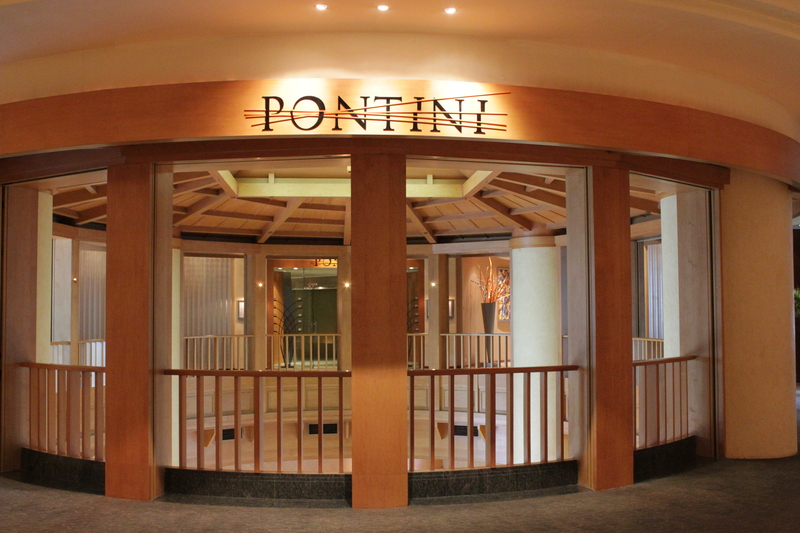 Met up with Hui Yuan ( from Lovin Greens) yesterday for lunch in the posh looking italian restaurant Pontini. As you all would probably know, I’m pretty new to the food blogging scene. Prior to this I’ve never met up with a complete stranger before, so this is a pretty novel experience for me! 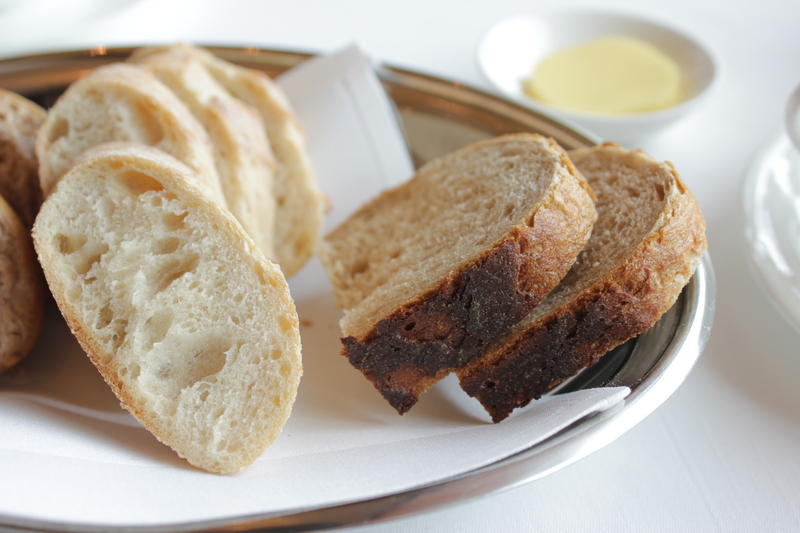 The complimentary bread served on a metal platter, was accompanied by a round cube of butter. I like having freshly baked bread unadulterated without any condiments, and the bread came across as alright, but not impressive. The baguette however seemed to have such a hard crust that I did not dare to hazard a try. I opted for the less expensive 3-course set lunch, which was 45++. Hui Yuan encouraged me to go for their antipasti buffet saying that there was a decent spread of antipasti available. But I never like buffets because I find that quantity often over-rides quality and I’m always overwhelmed by all the choices. 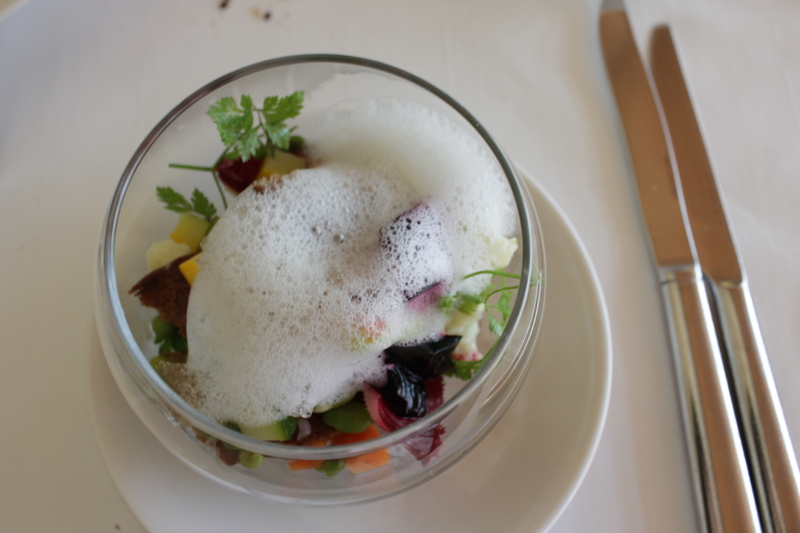 Hence, I decided on the Gorgonzola and Walnut Salad which sounded like a nice starter to get the tastebuds going. Gorgonzola is actually a form of italian blue cheese, thus explaining the strong odour smell that I had problems getting used to at first. 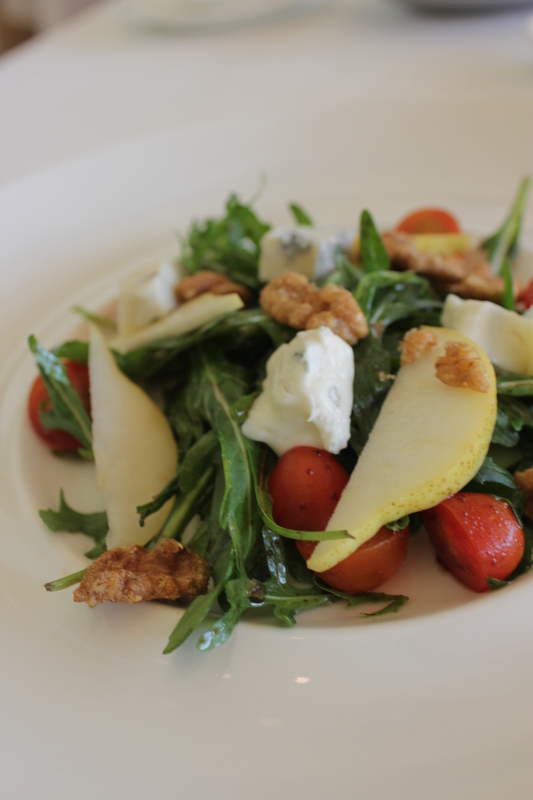 The salad consisted of rocket leaves, which are not exactly my favourite but after eating a few forkfuls, I found that the peppery taste complimented the savoury bits of gorgonzola, the sweet and crunchy toasted walnuts, the sourish baby tomatoes and the paper-thin slices of blush pears. 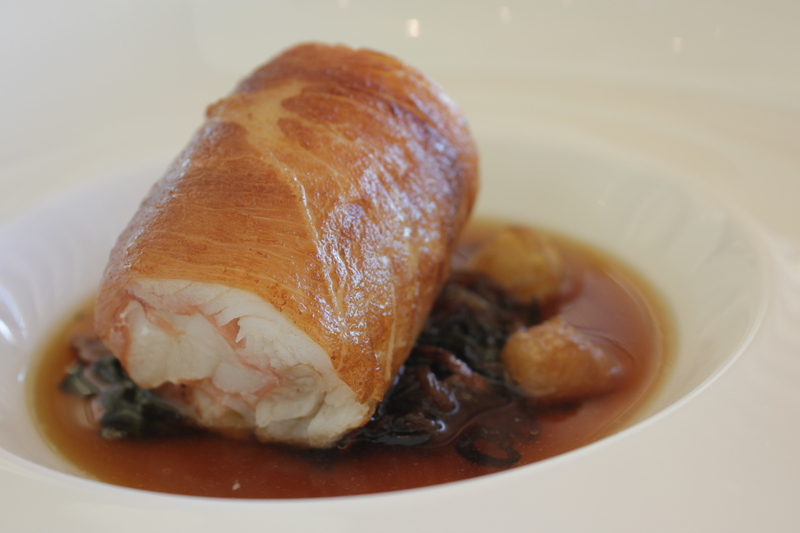 Overall a very multi-dimensional dish which was obviously put together after much consideration by the chef. Before giving my order, Hui Yuan warned me about the tendency of salmon being overdone, but I was in a mood for fish anyways so I went on with it. Being such an experienced fish eater, Hui Yuan immediately noticed that the sides of my salmon fillet was overdone. I was pretty disappointed initially, firstly due to the overdone chunks of salmon that were in my mouth and secondly due to the sight of roasted potatos below. 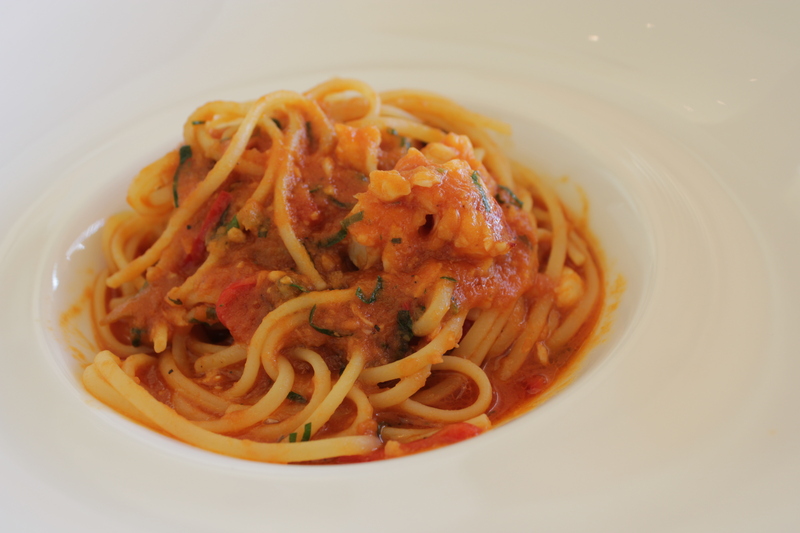 At that juncture, I started to miss the delicious salmon I had in spaghetti house at westfield when I was on holiday in london last december. 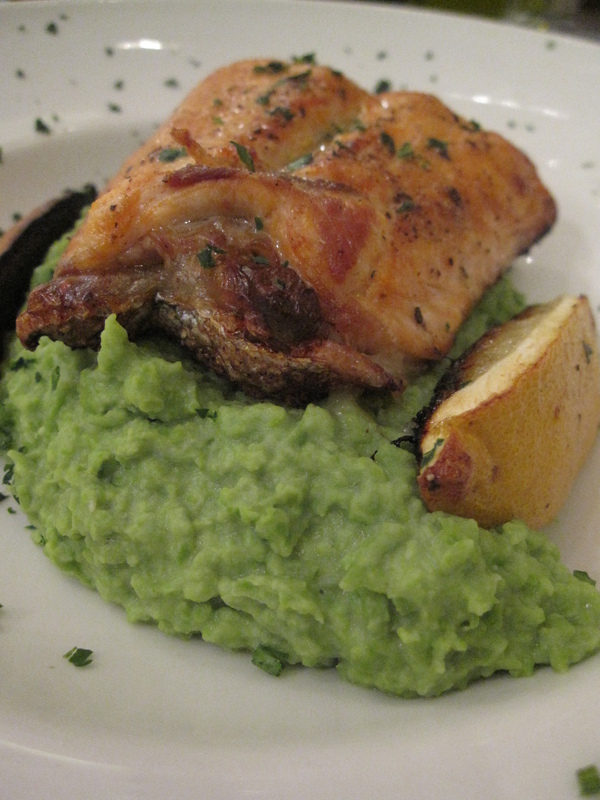 I would most certainly prefer pureed peas instead of roasted potatos to accompany my salmon! Nonetheless, I decided to give the baby potatos a try and I was shocked that I actually liked them…… a lot! They were roasted with their skins intact and lightly caramalized possibly through the brushing of honey before they were tossed into the oven. Moreover, they were well seasoned with black pepper and sea salt with light and fluffy innards. Now, I’m a roast potato convert! The thicker part of the salmon was thankfully not overcooked, but juicy and moist. 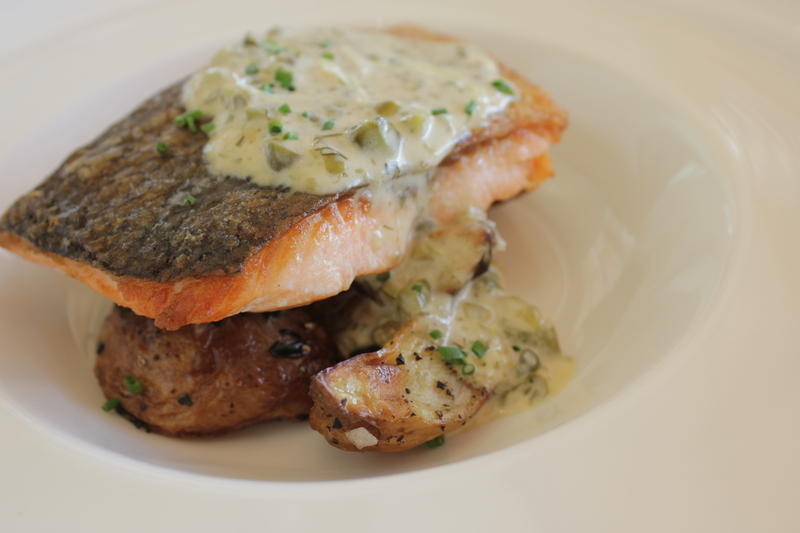 The lemon caper sauce added a nice sourish tang to the roast potatos and salmon as well. I really don’t blame the chef for overdoing the sides because it it almost impossible not to overdo them without underdoing the middle ( unless we take off the skin and butterfly fillet it like jamie oliver). I’ve been having one too many mini magnums at home recently ( the crunchy double caramel is so darn addictive!) so I decided against the cassata and opted for the apple tart in its place. 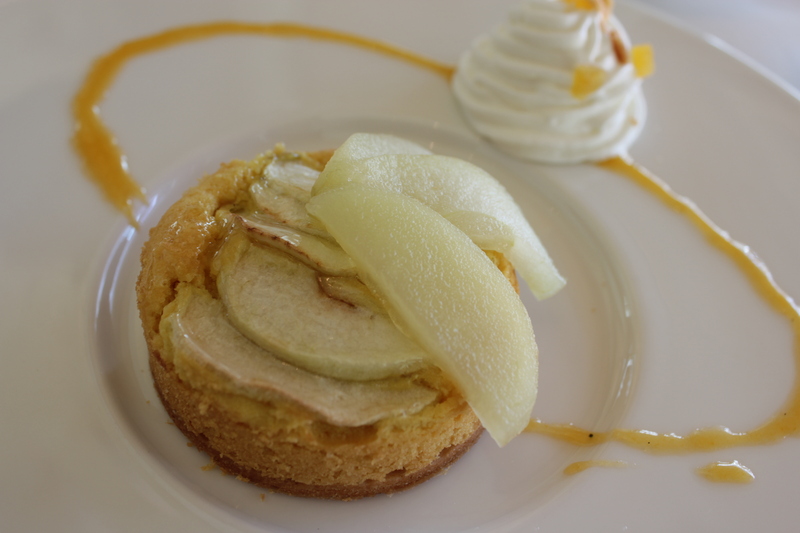 This apple tart would be more aptly named oranged tart because baring the slices of granny smith apples that adorned the top of the tart, the frangipane and tart base was flavoured with orange. I like the citrusy scent and taste of oranges which made the tart such a joy to eat. The cream was also thoughtfully placed at the side making it less of a hassle for people like me who hate cream. No offence to all kki lovers, but I actually think this was more impressive than their strawberry tart which also uses a frangipane filling. Hui Yuan opted for the 68++ set, which I felt was a little too pricey! You can go to her blog for more detailed comments about her food, because I only had a taste of each dish. Another enjoyable afternoon, spent with such a charming lunch date. Looking forward to our next rendezvous at le figue!